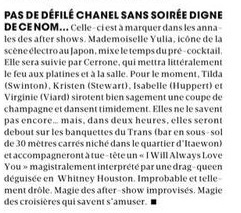 "For now, Tilda, Kristen, Isabelle and Virginie quietly sip champagne and dance timidly. They don't know it yet... but, in two hours, they will be standing on the Trans's sofas loudly singing along a "I Will Always Love You" masterfully performed by a drag queen disguised as Whitney Houston. Unlikely and so funny." 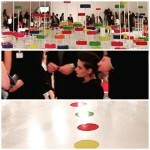 Kristen posed with Karl Lagerfeld, Isabelle Huppert, Gisèle Bundchen, Gaspard Ulliel & Alma Jodorowsky. 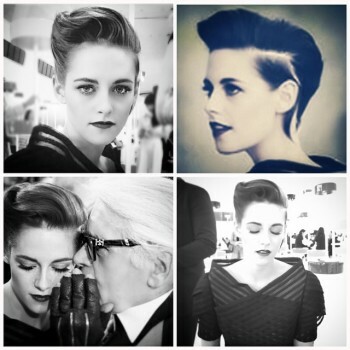 Adir: "Post #ChanelCruiseSeoul moment with my all time muse #kristenstewart. 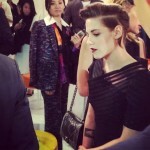 #chanel #muse"
Adir: "Some photos speak for themselves! Thank you @chanelofficial for the best week!!!!!" 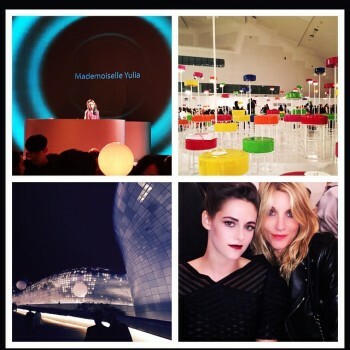 Jillian: "Giving some lip and lash @chanelofficial #ChanelCruiseSeoul styling by @taraswennenlifeinstyle hair by @hairbyadir and make up @jilliandempsey"
Tara: "#Chanel #Korea #FashionShow #Cruise2015/2016 #ILoveMyJob"
Kristen is wearing a Chanel Spring-Summer 2015 Couture dress, with Louboutin heels. The tweeds appealed most to Stewart. "I always love seeing the different takes on tweeds, because you think... how many versions can there be?" she noted. "But the neon was something very surprising and something that I'm really attracted to. I liked the relaxed fit in the tweed suits. Maybe it's just me projecting, but it's a little bit more androgynous but so beautiful." • Chanel: Welcoming in 2014 the Culture Chanel exhibition, the Dongdaemun Design Plaza is set to host the Cruise collection 2015/16 show. Devoid of a single angle or straight line, the world’s largest neo-futurist building, conceived by Zaha Hadid, instead plays out as a cohesive symphony of pure, continuous curves. Like some alien spaceship that has come to land in Seoul, the ovoid silver structure (measuring 86,574 square meters, or 931, 875 square feet) blends seamlessly into the urban landscape with its fluid, harmonious lines. The gaze ricochets off of this concrete structure sheathed in 45,133 individual aluminum panels, each distinct from the next. Equally spectacular is its interior – all twists and arches – which extends across three levels below ground and four above without the use of a single pillar. Features include a spiral staircase, a cylindrical gallery and spiral corridors, and a bright, Arctic-white lobby with a nine-meter high ceiling. The structure incorporates cultural artifacts discovered during archaeological excavations, including remnants of the ramparts that once surrounded Seoul on four nearby hills, dating back to the Joseon Dynasty (1392-1910). The first woman ever to win the prestigious Pritzker Prize, Zaha Hadid, born in Baghdad in 1950 but British by adoption, designed the Chanel Mobile Art pavilion in 2008 and is one of the favorite architects of Karl Lagerfeld. 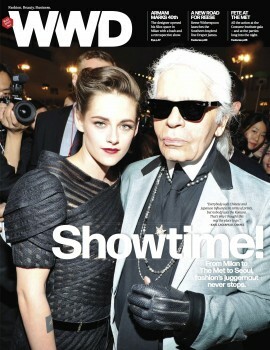 The transcript of her interview is above at the 'WWD Interview' section. Source: #1 #2 #3 #4 #5 #6 #7 #8 #9 #10 #11 #12 #13 #14 #15 #16 #17#17 #18 #19 #20 #21 #22 #23 #24 #25 #26 #27 #28 #29 #30 #31 #32 #33 #34 #35 #36 #37 #38 #39 #40 #41 - Thanks very much to gretababy1 & @2_jeong for the latest pictures & videos added.